PRODUCT: 100 Foot 15 Amp 125V Extension Cord, 12/3, Yellow SJTW UL/OSHA/ NEMA Approved Grade, Straight 5-15P Plug and 5-15C Connector (3-Wire, 2-Pole 125V). Price/Each. 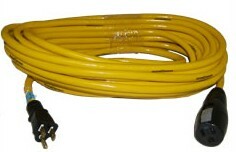 Superior Quality Contractor Grade Outdoor Extension Cord. and UL certified for all weather. * Super Flexible from -40F to +140F. APPLICATIONS: Professional heavy-duty round vinyl extension cords are designed for use by contractors and industrial personnel, as well as homeowners and workshop users. High visibility jacket protects against rough use, oil, grease, moisture, and ozone. Molded-on and bonded vinyl plugs and connectors won't break or pull off cord.